improve patient data accuracy and lower your costs. View item availability and pricing in real time, perform one-touch drop shipments and receive automatic confirmations, including delivery tracking and delivery notifications. More efficient workflows help relieve the mounting industry pressures of reduced reimbursement rates, additional compliance regulations, and higher shipping charges. Access the McKesson Medical-Surgical catalog from within the Brightree application so that you have the most current product information available – using your individual pricing structure. Do away with keying an order twice into both Brightree and McKesson Direct and go paperless, which reduces faxing, printing and other administrative tasks. Combining Integrated ePurchasing with drop ship ordering can significantly decrease inventory and delivery costs and create a “virtual inventory” – especially useful for maintenance supplies. To ensure patients are accurately receiving products, caregivers need an efficient solution for maintaining patient data when ordering products electronically. The Brightree Supply Interface, which is available to certified, licensed home health and hospice joint customers of Brightree and McKesson, sends demographic data one-way from Brightree to McKesson. The uploaded data benefits agency staff completing McKesson supply requests under a patient specific model since there is no need to re-enter patient demographic information with each request. The McKesson entry screen populates with the uploaded data of the selected patient. Are you a Brightree Customer? 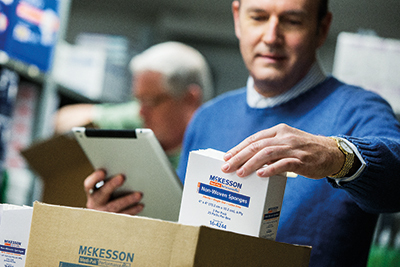 To learn how to streamline your McKesson ordering processes with Brightree, fill out the form below or call 1-888-598-7797. Copyright © 2017 Brightree LLC. Brightree is a registered trademark of Brightree LLC.